The Corporations Division of the Secretary of State of Florida keeps a database of the records of Corporations, Limited Liability Companies, Limited Partnerships and Limited Liability Partnerships. Any type of domestic or foreign entity registered in the state will have its information stored in the database. 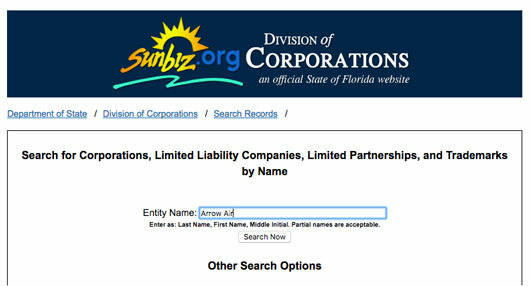 Step 1 – Click to go to the Florida Division of Corporation’s website to visit the Search Page (it will look something like the screenshot below). Step 2 – Type in the entity name in the given field. For example, let us key in “Arrow Air” in the blank space provided (see the screenshot below for reference). Step 3 – Click on the “Search Now” button. The next page will show a list of entities named “Arrow Air” along with their Document Number and Status. There are also files of the entity that you can download for more information. Apart from giving information regarding the registered entities, the official website of the Secretary of State provides easy filing options to form businesses or file reports (you can download the forms or complete them online). It should be noted that while most of the services and downloads are free of charge on Florida’s SOS website, there are some downloads which have may have a filing fee. In Florida, a Registered Agent is a legal requirement to be named for a registered entity. This is a single point of contact in case the business needs to be served with legal papers or contacted by the state. One of the business owners often file as the entities registered agent. When they file, their home address is often used (PO Boxes aren’t allowed) and their name address is now a public record that can be looked up by anyone. If that is a concern, consider looking into a Registered Agent service.